Throughout their range, rivers hold an abundance of walleyes, take a look at the U.S. and Canadian trophy walleye records, you will find that many were caught in rivers. Fishing rivers for walleye is an excellent trophy walleye choice for two reasons, first rivers do not receive the same fishing pressure as inland lakes so populations remain high and stable, second, river walleye are not effected as much by weather and water temperature changes like cold fronts as lake based walleye are. Many new walleye anglers have trouble learning how to fish river walleye versus fishing walleye in lakes, thus they get discouraged and don’t try again. If you’re going to go river walleye fishing there are two main factors to increase your catch rate, learn about river current (speed) with structure, and fluctuation of the water levels and how they both affect the walleye feeding behavior and locations so you can adjust your presentation accordingly. In developing a walleye fishing strategy on rivers, you can reduce many river segments because of too strong of current. Walleyes will tolerate some current, but seldom you will find them in fast water, they require some type of current break, an island, bridge piers, large rock formations and boulders, or drowned wood are all good structure providing a current break or edge. This is important to locating river walleyes, find the structure and fish downstream along the margin between slack and moving water, walleyes will hold here as a resting place occasionally darting out into the current to feed. Other successful locations are wing dams or other water obstructions that form eddies which provide current breaks both downstream and upstream. Many anglers don’t realize this and are overlooking fish by fishing the downstream side only, any current deflecting off structure creates a slack pocket (current break) on the upstream side which also holds walleyes. Undercuts and deep water pools should also be fished. As current flows around bends in rivers the outside becomes swifter, eroding the bank forming a undercut, on the opposite side the current slackens depositing bottom sediment forming a point or bar creating a current break which holds walleye on the downstream and upstream eddies. Deep water pools are formed by swift current, this is caused by a rapids- run – pool sequence on rivers and streams. Shallow water creates fast current (rapids) which consists of rocks, boulders and rubble, the next segment called a run is attributed by the velocity of the current off the rapids excavating a deep channel, as the current slows sediment is deposited on the downstream side of the run forming a pool. Walleyes will be hold in pools as the current is not too swift to feed. Over time the rapids – run – pool sequence will repeat as the sediment builds forming another shallow water rapids segment on the river. There are good and better times to fish walleyes in rivers, most experienced anglers prefer low level stable current flow, the water is clear, walleye locations are very predicable and concentrated in well known spots. Rising water levels from winter thaw or heavy rain can also be successful. Walleyes during this period will often move in shallow to feed or spawn seeking the warmest water temperatures, if the current becomes too swift, the walleye will move into backwater bays, oxbow bends and feeder creeks where there is practically no current. 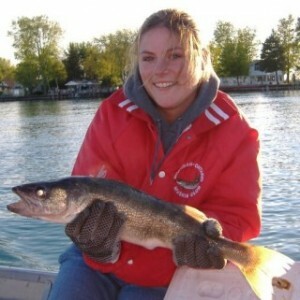 Walleyes will stay in a shallow pattern as long as the water is rising or has stabilized. Once they sense the water level dropping they will move back to deeper water in avoiding getting trapped in a dead backwater pool or shallow creek. As this occurs feeding slows and fishing becomes tougher. Most all walleye tactics will work fishing rivers for walleyes as in lakes. The most popular presentation is fishing with round or bullet-head shaped jigs (1/8-1/4oz) because these offer the least amount of resistance from current. Jigs are normally fished by casting from shore or an anchored boat upstream past structure allowing the jig to drift downstream presenting a natural look to a feeding walleye. Other techniques are vertical jigging while drifting with the current, stationary vertical jigging from a set position in deep water pools and trolling downstream with jigs bouncing along the bottom. Slip bobbers are used if the current is not too swift for pin point depth settings in deep water pools and current breaks or drop offs on bars and points. Bottom live bait rigs such as slip sinkers and three-way are commonly used if the river bottom is relatively clean of snags and boulders. Other productive tactics are casting minnow type floating crank-baits along rocky shorelines or beyond structure using a twitch and pause retrieve through an eddy or downstream current break. Trolling crank baits in main channels, along rocky shorelines off of bars, points and island drop offs are another productive option using lead core, bottom bouncers and split shot rigs.